292-314 Kent. Rendering by Practice for Architecture and Urbanism via Landmarks Preservation Commission. Update 10/31/17: The Landmarks Preservation Commission did not approve the new plans at the hearing, instead suggesting the architects present revised designs that address how the newly exposed brick will be preserved and how the ground floor will interact with the open space. The Commissioners were divided on the glass topper, with some feeling it appropriately references the building’s arches and others feeling it inappropriately treats the structure as a ruin. 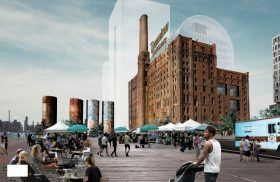 6sqft previously shared the latest round of designs for the three million-square-foot Domino Sugar Factory mega-development in Williamsburg, done by Vishaan Chakrabarti‘s Practice for Architecture and Urbanism (PAU). 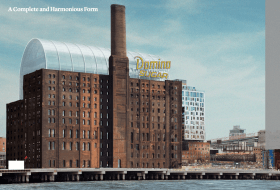 Developer Two Trees broke ground on the first tower in the Domino Sugar Refinery Master Plan last spring, and the lottery opened for 104 affordable units at the SHoP Architects-designed building, the 16-story 325 Kent Avenue. Now, more new renderings of the complex have been released ahead of an October 31 presentation before the Landmarks Preservation Commission (h/t Brownstoner). PAU design for the Domino Refinery. Image courtesy of Practice for Architecture and Urbanism. The past few years have seen as much change as progress in the rise of the three million-square-foot Domino Sugar Factory mega-development in Williamsburg; Two Trees broke ground on the first tower in the Domino Sugar Refinery Master Plan last spring, and the lottery opened for 104 affordable units at the SHoP Architects-designed building, the 16-story 325 Kent Avenue. 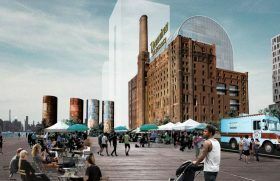 Last October we saw the first set of renderings by architecture firm Beyer Blinder Belle for the refinery building that will house Two Trees’ new 380,000-square-foot office space at the massive new complex; the corresponding plans had been approved by the Landmarks Preservation Commission in 2014. Now, Justin Davidson writes in New York Magazine that a new round of designs by Vishaan Chakrabarti‘s Practice for Architecture and Urbanism (PAU) have been revealed.